Waqf reportedly remains unsatisfied with new agreement forged between Israel and Jordan over replacement of Temple Mount metal detectors. Arab news sources are reporting this morning, Tuesday, that the Waqf, the Jordanian trust which manages Muslim sites on the Temple Mount, has expressed its opposition to the new agreement forged between Israel and Jordan over the Temple Mount. The agreement stipulated that Israel would replace the advanced metal detectors ("magnetometers") it had stationed on the Mount with other security measures. In return, Jordan would allow the return to Israel of the security official at Israel’s embassy in Jordan who shot and killed a terrorist who had attacked him. 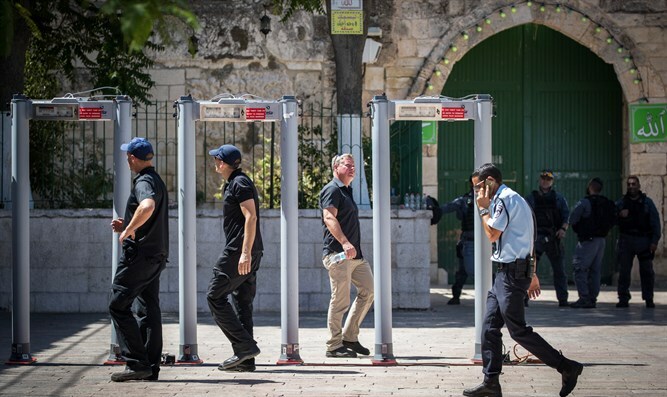 The metal detectors had been placed on the Temple Mount following the recent shooting terror attack there, which saw the murder of two Druze policemen. The detectors were met with opposition from the Waqf, which called on Muslims to pray outside the Temple Mount rather than pass through the detectors. The Israeli security official returned to Israel from Jordan on Monday night, and Israel this morning began to remove the metal detectors.